The Kampnagelfabrik, which is the venue for dance-, music- and theatrical performances, was a factory that produced cranes for the port until the 1970s. 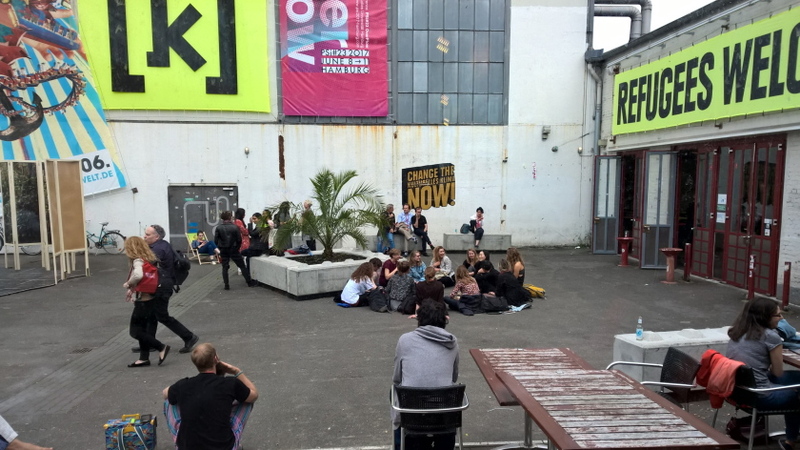 After it was closed artists squatted the building and evolved various cultural activities there. This all happened when ports were transformed worldwide by the innovation of containers, which required a complete revision of the logistic scheme. When housing the annual conference of Performance Studies international, one can also realize the effects of economic change on education in the actual phase of globalization, when knowledge becomes a part of profit oriented circulation of goods and services too. 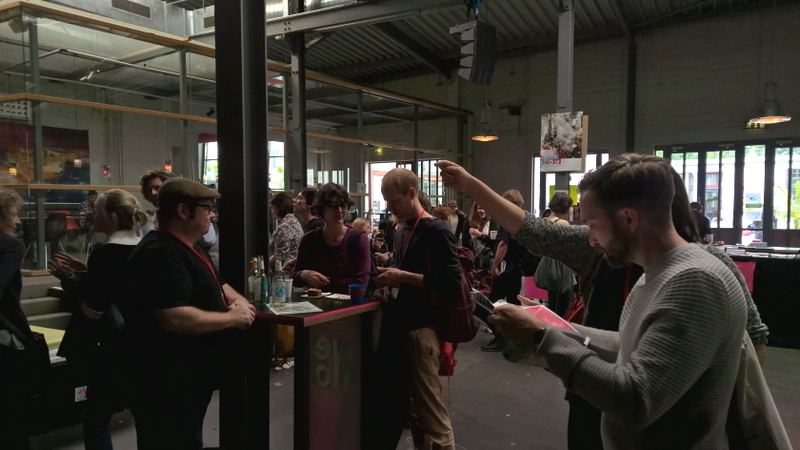 However the good thing that cultural knowledge also has faces bodies and minds, which can be met and experienced during conferences and festivals like OVERFLOW from June 8 to 11 in Hamburg. Probably there are hardly other fields than those of the arts, dance, theatre, music, ritual and play as well as public performances in which cultural experience and expertise are represented and kept over the centuries. PSi is a unique organization in which ideally practitioners of various fields of the performing arts meet academics of the theatre-faculties from the leading universities of the world. That fuels conflicts with institutions, which undergo restrictions, imposed by the neo-liberal management of universities. These were discussed right away on a Friday panel, which took place next to another one, where information on activism and performances in the overflowing City of Hong Kong was given. There students, intellectuals and artists fight for freedom which they have to defend against the requirements of capital and the circulation of commodities. The title of this conference is a metaphor describing the situation of the rich countries that profit from the exploitation of labor, agricultural and natural resources of the world, but you can also read it in a different way as the gifts, which are provided by the possibilities one has, when growing up on the sunny side of the word. Overflow can also be given to somebody for example through his or her intellectual and physical qualities, which enable a person to lead a full and happy life or resist stress and unrest. Overflow in terms of affluence as well as spill can also be poisonous and destructive. Power and wrong decisions can destroy people’s lives, nature and social stability. Streams of money are used to exploit the resources thus helping to establish a corrupt ruling-class like in Kongo and Nigeria. On the other hand overflow is created by culture in Europe these days, when the documenta 14 at Kassel and Athens. Also the Skulpturen-Projekte Münster are opened simultaneously and in addition to the Venice Biennale and the Theater der Welt in Hamburg. Those who have the resources and permits to travel can visit the presentation of works of a chosen number of creative people from all over the world. This is also true for the program of PSi #23. Every day the participants of the conference can browse through 70 titles of presentations of papers, lectures, performances, panel-discussions or workshops, and have to decide, which one to attend. Disciplined enough you sit in one out of 10 contributions of ideas, knowledge and research, ranging from artistic to cultural, political and economic topics, from personal to conceptual as well as to life acts and performances representing in itself the flow if not an overflow of human struggle with reality and the results of cultural procession of it. For those who feel that the earth is too small Maaike Bleeker and Felipe Cervera offered a 4 hour lasting session hosting a series of lecturers, who explored the possibilities of space such as Planetary Performance Theory, theatrical events on the popularization of research in astronomy (Kurt Vanhoutte), Soviet Sci-Fi-Movies (Natalija Maysova), Performances of the Leap Second (Sara Morawetz), Kinetic Theatre during a Parabolic Flight (Janez Janša), a hypnotic flight to the moon (Nahum) and more. But what means theatre today and what conditions do we find down on the earth especially in countries endangered by restrictions of the free speech and movement like in Turkey, Hongkong, Poland, not to speak about the dangers by losing once job or terror and crime. As it has been possible for me to visit only a small segment of the affluence of thoughts, ideas, results of research and elaborated papers I have to beg the pardon of all those, who came to Kampnagel to speak and present their papers and PowerPoints and are not mentioned here. However I will try to convey my observations as an essay on what I have listening to and experienced personally in encountering participants of the conference. So please take the excerpts that have been chosen as a possible whole. It is a subjective collection of a choice I made according to personal preferences as well as by coincidence. What I personally have experienced as a gift is a growing trust in each other to share knowledge, experience and expertise in the field, that has grown over decades and has its points of contact in many countries on 4 continents – and we still missing Africa, although the continent is present in many contributions reflecting the implications of the refugee-crises and post-colonial politics! Hamburg is lucky to have hosted this conference at such an impressive place. The link to art history however is missing. It was represented by Aby Warburg, who included contemporary pagan rituals and festivals into the focus of his research of images to understand Renaissance. The Kunstwissenschaftliche Bibliothek Warburg was founded in 1925, a few 100 meters away from the venue of the conference. It was saved from loss in London exile in 1933 and was re-institutionalized as a copy and research-institution after 1993 in the renovated Warburg-building in Hamburg. Unfortunately this promising link to Performance Studies was cut by those who are responsible for the division of the faculties at the University. More records are prepared to follow soon!